Can you ever get enough of God? By no means! Mark your calendars, Ladies! 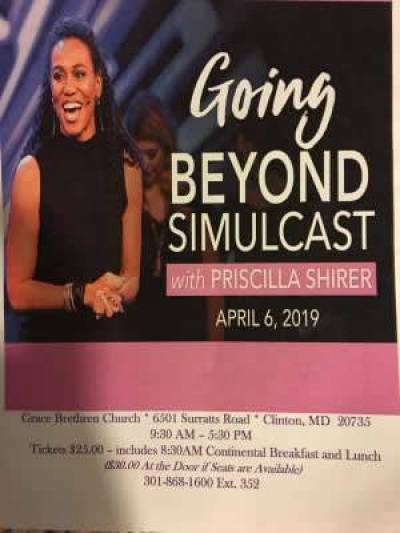 Grace Brethren Church in Clinton, MD is hosting the Going Beyond Simulcast with Priscilla Shirer on April 6, 2019. This is an all day event starting @ 8:30am with a continental breakfast and concluding @5:30pm with a light lunch and snack in between. Seats are limited, so make sure you secure your seats! Advanced tickets are $25.00 and, if available, $30.00 at the door. You can register at Going Beyond Simulcast and pay for your tickets online, following the instructions on the website. For any questions or comments, please contact Jada Harris at 301-868-1600 (Ext. 322) or at jada.harris@gbcseagles.org.